Rubella virus is a togavirus of the genus Rubivirus. *see also Laboratory Aspects section. **The need for confirmation in a reference laboratory is part of the national case definition. In Queensland, Pathology Queensland, QML and S&N all use EIA for rubella IgM. Each of these is considered a valid IgM result without need for testing in another lab. However, consideration should be given to the likelihood of false positive IgM, particularly in a pregnant woman. Please refer to the Laboratory Aspects section for more details. Detection of rubella-specific IgM antibody in the serum of the infant AND confirmation of the result in a reference laboratory. IgG seroconversion or a significant increase in antibody level or a fourfold or greater rise in titre to rubella virus. This must be established by the testing of paired sera in parallel. Detection of rubella-specific IgM, in the absence of recent rubella vaccination AND confirmation of the result in a reference laboratory**. Infant rubella-specific antibody that persists at a higher level and for a longer period than expected from passive transfer of maternal antibody (i.e. rubella titre that does not drop at the expected rate of a two-fold dilution per month). To notify on microbiological or serological confirmation of rubella or congenital rubella syndrome, by usual means. IgM is produced early after vaccination, reaching a peak at one month and lasting approximately one month more, but may persist for longer at low levels. In acute infection, IgM usually becomes detectable shortly after the rash onset, peaks approximately seven days after rash onset and remains detectable for 4-12 weeks). Because rubella incidence in Australia is low, a high proportion of IgM-positive tests will likely be false positive. False-positive serum rubella IgM tests may occur due to the presence of rheumatoid factors (indicating rheumatologic disease) or cross-reacting IgM, or infection with other viruses. Testing repeat samples in parallel and detection of wild-type rubella virus by PCR can be used to resolve uncertainties in the serologic evaluation of suspected cases. The best specimens for PCR detection are throat or nasopharyngeal swab or urine. Blood can be used, but has not been validated. Particular care should be taken when rubella IgM is detected in a pregnant woman with no history of illness or contact with a rubella-like illness. Although this is not recommended, many pregnant women with no known exposure to rubella are tested for rubella IgM as part of their antenatal care. If rubella test results are IgM-positive for persons who have no or low risk of exposure to rubella, additional laboratory evaluation should be conducted. Laboratory evaluation is similar to that described in the IgM-positive section of Appendix 1 - Serologic evaluation of pregnant women exposed to rubella. A probable case requires clinical evidence AND either laboratory suggestive evidence OR epidemiological evidence. Congenital rubella syndromeBoth confirmed and probable cases should be notified. A probable case requires laboratory suggestive evidence (either maternal or infant) AND clinical evidence. To monitor the epidemiology of rubella and congenital rubella syndrome in Queensland to inform public health initiatives. To identify cases and outbreaks of rubella to enable appropriate public health responses. Because Rubella is usually a mild disease with non-specific symptoms it is often difficult to diagnose clinically. However, Rubella is of public health significance because infection during pregnancy can cause miscarriage (up to 20% of cases in the first 8 weeks of gestation), foetal death and congenital anomalies. Congenital rubella syndrome occurs in up to 90% of infants born to women who acquire rubella during the first trimester of pregnancy. The risk of a single congenital defect falls to approximately 10 - 20% by the 16th week and defects are rare when the maternal infection occurs after the 20th week of gestation. The most common congenital defects are cataracts, heart defects and hearing impairment. The incidence of congenital rubella infection has decreased markedly since the schoolgirl vaccination program was initiated in Australia in the early 1970s. Australia has the opportunity to eliminate endemic rubella with rates of reported disease less than one case per 100,000 population since 2002. Rubella is a mild febrile viral disease with a diffuse, punctate and maculopapular rash. Clinically, this is usually indistinguishable from febrile rash illness due to measles, dengue, parvovirus B19, human herpesvirus 6, coxsackie virus, echovirus, adenovirus or scarlet fever. The rash occurs in 50%-80% of rubella infected persons. Children usually present few or no constitutional symptoms, but adults may experience a 1-5 day prodrome of low grade fever, headache, malaise, mild coryza, and conjunctivitis. Post-auricular, occipital and posterior cervical lymphadenopathy is the most characteristic clinical feature, and precedes the rash by 5-10 days. Many cases (up to 50%) are subclinical. Arthralgia or arthritis may occur in up to 70% of adult women who contract rubella, but is rare in children and adult males. Fingers, wrists, and knees are often affected. Joint symptoms tend to occur about the same time or shortly after appearance of the rash and may last for up to 1 month; chronic arthritis is rare. Hemorrhagic manifestations occur in approximately one per 3,000 cases, occurring more often in children than in adults. These manifestations may be secondary to low platelets and vascular damage, with thrombocytopenic purpura being the most common manifestation. Gastrointestinal, cerebral, or intracranial haemorrhage may occur. Effects may last from days to months, and most patients recover. Rubella is important because it can produce a constellation of anomalies in the developing foetus. Congenital rubella syndrome is an illness resulting from embryonic / foetal rubella virus infection. CRS occurs in up to 90% of infants born to women who are infected with rubella in the first 10 weeks of pregnancy. Infection early in pregnancy conveys the greatest risk of intrauterine death, spontaneous abortion and congenital malformations of major organ systems. The risk of defects declines when maternal infection occurs after the 12th week of pregnancy and defects are rare when maternal infection occurs after the 20th week. The specific signs and symptoms of congenital rubella syndrome may be classified as temporal e.g. low birth weight; permanent e.g. deafness; and developmental e.g. myopia. Common manifestations include: cataracts, microphthalmia, congenital glaucoma, microcephaly, meningoencephalitis, developmental delay, patent ductus arteriosus, atrial or ventricular septal defects, purpura, hepatosplenomegaly, jaundice, and radiolucent bone disease. Moderate and severe CRS is usually recognisable at birth. Mild CRS with only slight cardiac involvement or hearing impairment may not be detected for months or even years after birth. Diabetes mellitus in late childhood has been observed 50 times more frequently in children with CRS than without it. Humans are the only known reservoir. Droplet spread and direct contact with nasopharyngeal secretions of people infected with rubella virus. Rubella vaccine virus is not generally transmitted from vaccinated persons to susceptible contacts. The vaccine virus is secreted in breast milk, and rare cases of transmission of vaccine virus through breast milk have been reported. However, symptoms in the newborn have been mild or absent and post-partum vaccination of women need not be delayed because of breastfeeding. From 14 – 17 days with a range of 14 – 21 days. Rubella is highly communicable. The period of communicability is approximately one week before and at least 4 days after the onset of rash. People with rubella are most infectious when the rash is erupting. Infants with congenital rubella syndrome shed virus in their pharyngeal secretions and urine for up to one year after birth and can therefore transmit the virus to susceptible people caring for them. Immunity is usually permanent after natural infection and thought to be lifelong after immunisation. Ninety-five percent of people seroconvert after one dose of rubella-containing vaccine. However, rubella reinfection can occur in individuals who have both natural and vaccine-induced immunity. Re-infection is not associated with a lack of neutralising antibodies, and viraemia is rare. In some studies, reinfection leads only to an IgG booster response, without IgM, whereas in others the appearance of IgM suggests significant viral replication. Clinical rubella has been documented during reinfection of vaccinated and naturally immune individuals. Occasional cases of congenital rubella syndrome after reinfection in pregnancy have been reported. The risk of foetal transmission is probably less than 5% in the first trimester (compared to at least 80% in primary infection). Infants born to immune mothers are ordinarily protected for 6-9 months, depending on the quantity of maternal antibodies acquired transplacentally. Investigation In consultation with the attending medical practitioner, ensure laboratory confirmation and all relevant clinical and demographic information are obtained. Ascertain vaccination status with respect to rubella. Laboratory confirmation is recommended for all sporadic cases of rubella and all suspected cases of congenital rubella syndrome. As per the current NHMRC recommendations, exclude rubella cases from school/institution/work until 4 days after onset of rash or until fully recovered, whichever is longer. Avoid contact with women of child bearing age and pregnant women. In hospitals, as per current Queensland Health infection control guidelines, patients with suspected or proven rubella should be managed with contact and droplet precautions until 7 days after onset of rash or until fully recovered, whichever is longer. Contact isolation precautions should be applied to infants less than 12 months of age with CRS unless urine and pharyngeal cultures are negative for rubella virus. Infants with congenital rubella syndrome should be excluded from childcare and avoid contact with pregnant women for the first 12 months of life unless urine and pharyngeal specimens are negative for rubella virus either by culture or by NAT after three months of age. The case should be advised of the nature of the infection and its mode of transmission. If other vaccinations are incomplete, recommend catch up once recovered. If the patient is pregnant, obtain information regarding number of weeks of gestation at onset of illness. Refer the case promptly to their obstetrician/clinician for counselling regarding the risks of intrauterine rubella infection and appropriate follow-up. If possible, follow up with the referring clinician for pregnancy outcome. Anyone who is likely to have been exposed to the nose or throat secretions of a person with rubella during their infectious period. Although rubella transmission is usually associated with repeated exposure, transmission has been documented after a single exposure. Prioritise investigation based on the probability of transmission. First priority should be people who share a household with the case, people who attend the same class at school or childcare as the case and people who are work or social contacts of the case. Particular effort should be made to identify all pregnant women who might have been exposed and ensure they are reviewed by their clinician and serologically tested for rubella. Pregnant women and women who are planning a pregnancy should be serologically tested. Any contact who does not have adequate proof of immunity is a susceptible contact. All susceptible non-pregnant contacts aged 12 months and older should be offered a single dose of MMR vaccine, provided there are no contraindications to the vaccine. This will not prevent disease if the contact is already infected. Women who are planning a pregnancy should be advised not to become pregnant for 28 days after receiving the vaccine. Recommend that all susceptible people avoid contact with the case for at least four days after the onset of rash. 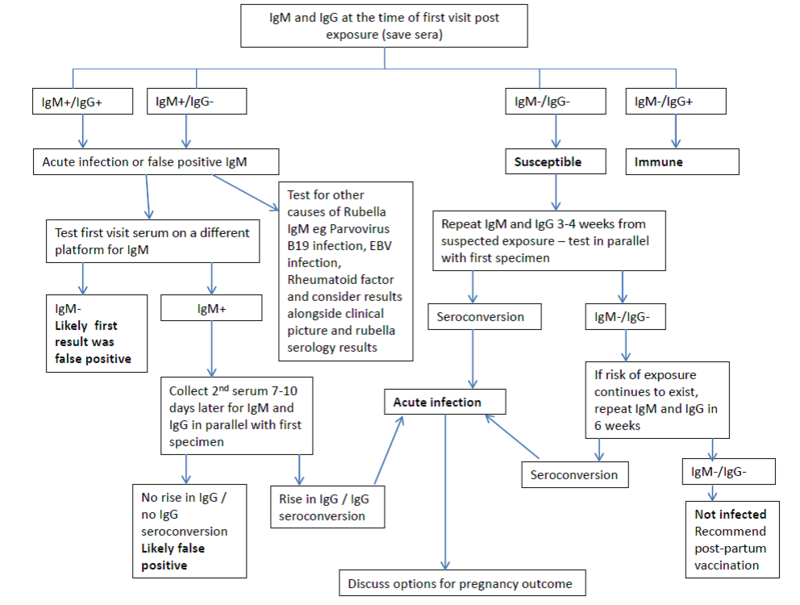 Refer pregnant contacts to their clinicians for serologic evaluation of rubella-specific IgM and IgG antibodies (see Appendix) and counselling regarding the risks for intrauterine rubella infection. If the woman has an IgG antibody titre below the protective level, or is IgG negative, and remains asymptomatic, a second blood specimen should be collected 28 days after the exposure and tested in parallel with the first to detect subclinical infection. If the woman develops symptoms, specimens for rubella PCR and blood for rubella and other viral serology should be collected and tested as soon as possible to confirm diagnosis of rubella and exclude other relevant viral illnesses. Susceptible pregnant contacts should avoid further contact with the case and with close contacts of the case for six weeks (two incubation periods) after the onset of symptoms of rubella in the last case. Surveillance for CRS should be implemented when confirmed or probable rubella cases are documented in a setting where pregnant women might have been exposed. Post-exposure prophylaxis with NHIG (20 mls by deep IM injection in divided doses) within 72 hours of rubella exposure might reduce – but will not eliminate – the risk for rubella. Experimental studies in the 1960s confirmed the efficacy of passive antibody in preventing both viremia and clinical rubella, but there were numerous failures of gamma-globulin to prevent congenital foetal abnormality in actual practice. In one study of CRS patients, up to 6% of mothers gave histories of receipt of gamma-globulin after exposure to rubella. The newer intravenous gamma-globulins do not have high concentrations of rubella antibodies, presumably because the antibodies are now the result of immunisation rather than disease, so a higher failure rate may be expected. Susceptible pregnant contacts of confirmed rubella cases should discuss PEP with their obstetrician/clinician, including a frank discussion of risks and possible benefits. Serological follow up of recipients is essential. IgM should be done once every two weeks for two months after last contact with the case to establish whether delayed or subclinical infection occurs. NHIG is available from the Red Cross Blood Bank. The PHU is responsible for notifying the obstetrician/treating clinician on the process for accessing NHIG for their patient if required. (See the following webpage for order form and contact details for CSL: http://www.blood.gov.au/NHIg (current as at 13 April 2015). NHIG should be given by deep IM injection, using an appropriately sized needle. The NHIG should be introduced slowly into the muscle, to reduce pain. This product must not be administered intravenously because of possible severe adverse events, and hence an attempt to draw back on the syringe after IM insertion of the needle should be made in order to ensure that the needle is not in a small vessel. A special product for IV use (NHIG [intravenous]) has been developed for patients requiring large doses of immunoglobulin. b) seven days after the onset of rash if illness develops or until fully recovered, whichever is longer. Susceptible non-pregnant health care workers should be offered MMR vaccine, although post-exposure vaccination will not prevent rubella infection following exposure. Identify potentially susceptible groups and high risk settings to promote awareness and vaccination. Alert GPs, Emergency Departments and childcare facilities to enhance surveillance and case ascertainment. Exclude non-immune pregnant women from workplaces with identified transmission. Alert hospital infection control practitioners so they can implement the recommendations in health care settings e.g. antenatal clinics. MMR vaccination is recommended for all infants at 12 months of age, and MMRV (as the second dose of rubella containing vaccine) is recommended for all infants at 18 months of age. Women of child bearing age should be tested prior to pregnancy, if possible. All seronegative women, if not pregnant or intending to become pregnant within 28 days, should be offered free MMR vaccine. Opportunities for screening include general practice, antenatal care, and at family planning, infertility and occupational health clinics. All seronegative pregnant women should be offered free MMR vaccine post-partum. Opportunities include the post-natal ward and the six week postnatal visit (women should be advised not to become pregnant for 28 days after vaccination). If born during or after 1966, and there is an absence of vaccination records or there is seronegativity on screening, all adults, and particularly male and female child care workers and staff and students in health care facilities who have contact with patients, should receive MMR vaccination. Use epidemiologic and published data to identify groups with low vaccination coverage (e.g. some migrant groups) and enhance opportunities for vaccination. Prepare a report of investigation for the Communicable Diseases and Infection Management Unit, Queensland Health, on request. Australian Department of Health and Ageing. 2013. The Australian Immunisation Handbook (10th ed). Australian Government: Canberra. Bennett J Dolin R and Blaser M (2015) Mandell, Douglas and Bennett's Principles and Practice of Infectious Diseases Elsevier Saunders Philadelphia. Begg K, Roche P, Owen R, Liu C et al. 2008. Australia's notifiable diseases status, 2006: annual report of the national notifiable diseases surveillance system. Comm Dis Intell 32(2): 139-207. Bouthry E, Picone O, Hamdi G, Grangeot-Keros L, Ayoubi JM, Vauloup-Fellous C. Rubella and pregnancy: diagnosis, management and outcomes. 2014. Prenatal Diagnosis 34: 1246-53. CDC Atlanta Chapter 14 Rubella VPD Surveillance Manual 2012. Communicable Disease Control Atlanta. CDC.2013. Measles, mumps and rubella - vaccine use and strategies for elimination of measles, rubella and congenital rubella syndrome and control of mumps: Summary recommendations of the Advisory Committee on Immunisation Practices (ACIP). MMWR 62 (No. RR-04; 1-34). Heymann D. (Ed). 2015. Control of Communicable Diseases Manual (20th ed). American Public Health Association: Washington. Khandaker G, Zurynski Y and Jones C. 2014. Surveillance for congenital rubella in Australia since 1993: Cases reported between 2004 and 2013. Vaccine 32:50 Nov pg 6746-6751. Plotkin S, Orenstein W, Offit P. 2008. Vaccines (5th ed). Saunders Elsevier.